In the end, it comes down to values, as was said so many times today. We want the world our children inherit to be defined by the values enshrined in the UN Charter: peace, justice, respect, human rights, tolerance and solidarity. Thank you very much for all your kind words. I am deeply honoured by the trust and confidence Member States have placed in me, and determined to be guided by the purposes and principles of the Charter. First of all, I would like to pay tribute to Secretary-General Ban Ki-moon. 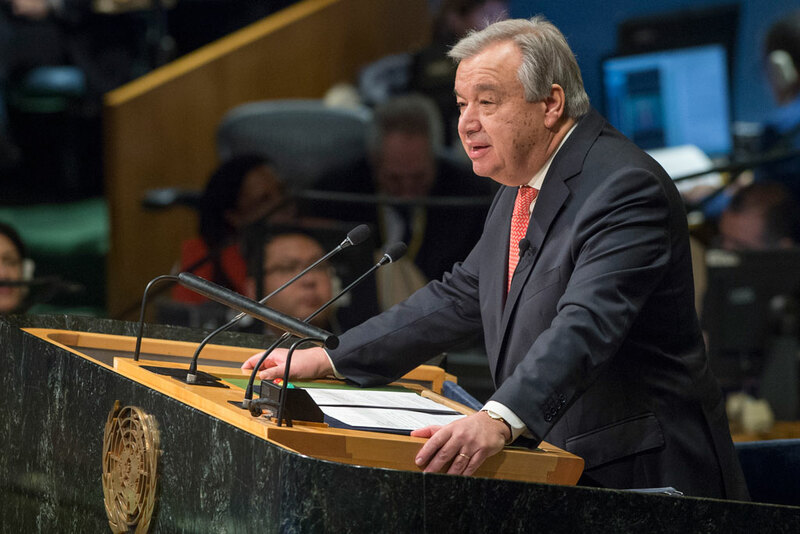 Secretary-General, your principled leadership has helped to chart the future of the United Nations — through the 2030 Agenda for Sustainable Development; through your commitment to peace and security; through your initiative to put human rights at the heart of our work. Under your direction, the world committed to the historic Paris Agreement on climate change — and ratified it in record time. I strongly believe this momentum is unstoppable. Dear Secretary-General Ban Ki-moon, it is an honour to follow in your steps, defending the same values that unite us. Thank you very much. Twenty-one years ago, when I took the oath of office to become Prime Minister of Portugal, the world was riding a wave of optimism. The cold war had ended, and some described that as the end of history. They believed we would live in a peaceful, stable world with economic growth and prosperity for all. But, the end of the cold war wasn’t the end of history. On the contrary, history had simply been frozen in some places. When the old order melted away, history came back with a vengeance. Hidden contradictions and tensions resurfaced. New wars multiplied and old ones reignited. Lack of clarity in power relations led progressively to greater unpredictability and impunity. Conflicts have become more complex — and interlinked — than ever before. They produce horrific violations of international humanitarian law and human rights abuses. People have been forced to flee their homes on a scale unseen in decades. And a new threat has emerged — global terrorism. Megatrends — including climate change, population growth, rapid urbanization, food insecurity and water scarcity — have increased competition for resources and heightened tensions and instability. At the same time, the last 20 years have seen extraordinary technological progress. The global economy has grown; basic social indicators have improved. The proportion of people living in absolute poverty has fallen dramatically. But, globalization and technological progress have also contributed to growing inequalities. A lot of people have been left behind, even including in developed countries where millions of old jobs have disappeared and new ones are out of reach for many. In many parts, youth unemployment has exploded. And globalization has also broadened the reach of organized crime and trafficking. All this has deepened the divide between people and political establishments. In some countries, we have seen growing instability, social unrest — even violence and conflict. A little bit everywhere, voters now tend to reject the status quo, and whatever Government proposal is put to a referendum. Many have lost confidence not only in their Governments, but in global institutions — including the United Nations. Fear is driving the decisions of many people around the world. We must understand their anxieties and meet their needs, without losing sight of our universal values. It is time to reconstruct relations between people and leaders — national and international; time for leaders to listen and show that they care, about their own people and about the global stability and solidarity on which we all depend. And it is time for the United Nations to do the same: to recognize its shortcomings and to reform the way it works. This Organization is the cornerstone of multilateralism, and has contributed to decades of relative peace. But, the challenges are now surpassing our ability to respond. The United Nations must be ready to change. Our most serious shortcoming — and here I refer to the entire international community – is our inability to prevent crises. The United Nations was born from war. Today, we must be here for peace. La prévention exige que nous nous attaquions aux causes profondes à travers les trois piliers des Nations Unies: la paix et la sécurité, le développement durable et les droits humains. Cela doit être la priorité dans tout ce que nous faisons. La prévention exige que nous soutenions plus les pays dans leurs efforts pour renforcer leurs institutions et rendre leurs sociétés plus résilientes. Il s’agit aussi de rétablir les droits humains comme une valeur fondamentale qui doit être défendue en tant que telle, et non à des fins politiques autres. Tous, y compris les minorités de tout genre, doivent pouvoir jouir de l’ensemble des droits humains – civils, politiques, économiques, sociaux et culturels – sans aucune discrimination. Protéger et autonomiser les femmes et les filles est primordial. L’égalité des genres est essentielle au développement, et le rôle clé qu’elle joue dans la consolidation et le maintien de la paix devient de plus en plus indéniable. La prévention n’est pas un concept nouveau : c’est ce que les fondateurs des Nations Unies nous ont demandé de faire et elle constitue le meilleur moyen de sauver des vies et d’alléger la souffrance humaine. Mais lorsque la prévention échoue, nous devons redoubler d’efforts pour régler les conflits. Des crises les plus aïgues, en Syrie, au Yémen, au Soudan du Sud et ailleurs, aux disputes de longue date, y compris le conflit israélo-palestinien, il nous faut davantage de médiation, d'arbitrage et de diplomatie créative. Je suis prêt à m’engager personnellement à travers mes bons offices dans la résolution des conflits mais lorsque cela constitue une plus-value, tout en reconnaissant le rôle de premier plan des États Membres. L’échelle des défis auxquels nous sommes confrontés nous contraint à travailler de concert, pour réformer les Nations Unies de manière approfondie et continue. Je souhaiterais esquisser ici trois priorités stratégiques de cette réforme: dans notre travail en faveur de la paix; notre appui au développement durable; et notre gestion interne. Les femmes et les hommes travaillant dans les opérations de maintien de la paix des Nations Unies nous apportent une contribution héroïque au péril de leurs vies. Toutefois, ils se voient souvent confier la tâche de maintenir une paix qui n’existe pas. Nous devons donc nous entendre sur ce que recoupe le travail de maintien de la paix, afin de jeter les bases d’une réforme urgente. Nous devons créer un fil conducteur pour la paix qui relie la prévention et la résolution des conflits, le maintien et la consolidation de la paix, et le développement. Nous devons nous appuyer sur les conclusions des trois récents rapports, ainsi que les résolutions parallèles de l’Assemblée générale et du Conseil de sécurité. Le moment est venu pour nous tous, inspirés par le nouveau concept de pérennisation de la paix, de nous engager dans une réforme globale de la stratégie, des opérations et des structures des Nations Unies visant la paix et la sécurité. Cette réforme doit également inclure un examen de notre travail dans le domaine de la lutte antiterroriste, et un meilleur mécanisme de coordination entre les 38 entités des Nations Unies qui sont concernées. The United Nations system has not yet done enough to prevent and respond to the appalling crimes of sexual violence and exploitation committed under the UN flag against those we are supposed to protect. I will work closely with Member States on structural, legal and operational measures to make the zero-tolerance policy for which Secretary-General Ban Ki-moon has fought so hard a reality. We must ensure transparency and accountability and offer protection and effective remedies to the victims. The second key element of the reform agenda concerns the United Nations support to Member States in achieving the Sustainable Development Goals and the objectives of the Paris Agreement, an expression of global solidarity, with their promise to leave no one behind. To do this, we will reposition development at the centre of our work, and engage in a comprehensive reform of the United Nations development system, at Headquarters and country levels. This must involve leadership, coordination, delivery and accountability. We will build on the outcome of the recent discussions among Member States. We must also bring the humanitarian and development spheres closer together from the very beginning of a crisis to support affected communities, address structural and economic impacts and help prevent a new spiral of fragility and instability. Humanitarian response, sustainable development and sustaining peace are three sides of the same triangle. This approach relates to the new way of working agreed at the World Humanitarian Summit. To achieve this, we need more accountability, on the level of each individual agency carrying out its mandate, but also its contribution to the work of the United Nations system and of the system as a whole. A strong culture of accountability also requires effective and independent evaluation mechanisms. The third key area is management reform. We will build on existing efforts and implement the recent initiatives that were approved. But, looking at United Nations staff and budgetary rules and regulations, one might think that some of them were designed to prevent, rather than enable, the effective delivery of our mandates. We need to create a consensus around simplification, decentralization and flexibility. It benefits no one if it takes nine months to deploy a staff member to the field. The United Nations needs to be nimble, efficient and effective. It must focus more on delivery and less on process; more on people and less on bureaucracy. A culture of accountability also requires strong performance management and effective protection for whistle-blowers. And it is not enough just to do better. We must be able to communicate better about what we do, in ways that everybody understands. We need a substantial reform of our communications strategy, upgrading our tools and platforms to reach people around the world. Finally, management reform must ensure we reach gender parity sooner rather than later. The initial target for the equal representation of women and men among United Nations staff was the year 2000. Sixteen years later, we are far from that goal. I pledge to respect gender parity from the start in all my appointments to the Senior Management Group and the Chief Executives Board. By the end of my mandate, we should reach full gender parity at the Under-Secretary-General and Assistant Secretary-General levels, including special representatives and special envoys. We need a clear road map with benchmarks and time frames to achieve parity across the system, well before the target year of 2030. And the same concern applies to regional diversity. Finally, any investment in a stronger United Nations must take staff into account. I look forward to working once again alongside over 85,000 men and women carrying out our mandate in 180 countries across the globe. Many of them work in difficult and sometimes dangerous circumstances. With their professionalism, expertise and dedication, they are the United Nations’ most important resource, a resource that has to be cared for, developed and used efficiently, and whose voice needs to be heard. We live in a complex world. The United Nations cannot succeed alone. Partnership must continue to be at the heart of our strategy. We should have the humility to acknowledge the essential role of other actors while maintaining full awareness of our unique convening power. Our humanitarian and development efforts would be insignificant without the active involvement of Member States and the contributions of civil society, international financial institutions, private investors and even financial markets. Several mediation efforts and peace operations would not be possible without the engagement of regional organizations, particularly the African Union, our most relevant international regional partner, both in peace and security and in development. Pero en nuestra estrategia hay un vacío: el labor con los jóvenes. Durante demasiado tiempo, los jóvenes se han visto excluidos de la toma de decisiones que afectan a su futuro. Debemos aprovechar la labor realizada en el pasado con el apoyo de los Estados Miembros, el Enviado para la Juventud y la sociedad civil. Pero esta no puede ser una iniciativa donde los ancianos sean quienes hablen de las nuevas generaciones. Las Naciones Unidas deben empoderar a los jóvenes y aumentar su participación en la sociedad y su acceso a la educación, la formación y el empleo. Today´s paradox is that, despite greater connectivity, societies are becoming more fragmented. More and more people live within their own bubbles, unable to appreciate their links with the whole human family. In the end, it comes down to values, as was said so many times today. We want the world our children inherit to be defined by the values enshrined in the United Nations Charter: peace, justice, respect, human rights, tolerance and solidarity. All major religions embrace these principles, and we strive to reflect them in our daily lives. But, the threats to these values are most often based on fear. Our duty to the peoples we serve is to work together to move from fear of each other, to trust in each other. Trust in the values that bind us and trust in the institutions that serve and protect us. My contribution to the United Nations will be aimed at inspiring that trust, as I do my best to serve our common humanity. Thank you very much.